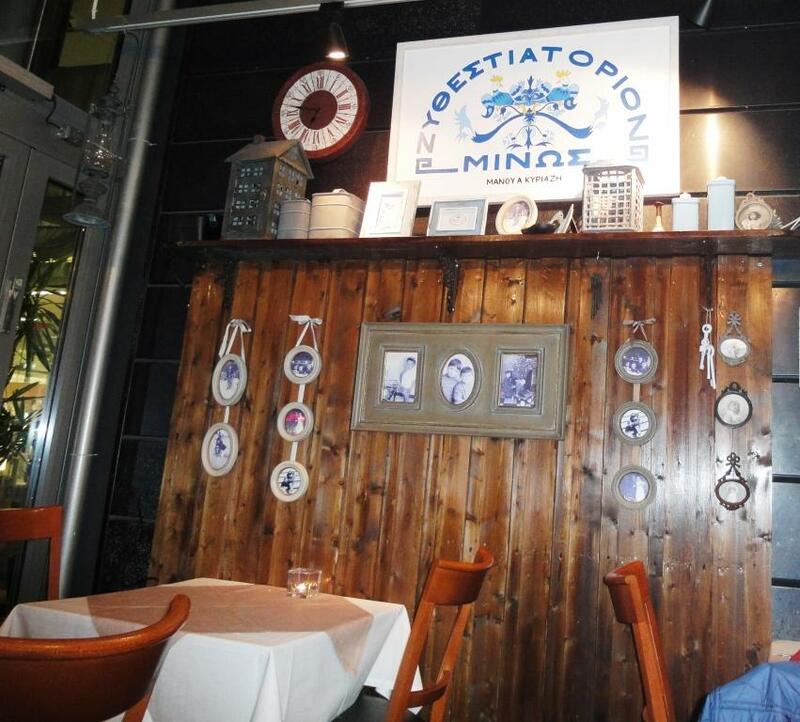 Restaurant Minos is over 25 years old restaurant, which serves traditional Greek food. Clear proof of authenticity is language used by waiters/waiteresses; they talk to each other in Greek. Minos has pleasant covered terrace, which can be used also in the winter time, as it is heated. Always choose to dine at the terrace, because you can observe by-passers at the same time. In the summer Minos has it’s own spot in popular Kamppi shopping center terrace area serving Greek wines and for instance Mythos beer. For starters chose of course again Tzatziki yoghurt and cucumber salad and Dolmades vine leaves stuffed with rise and herbs. Greek starters are always delicious, still miss taramosalata from holidays, but unfortunately it is not available at Minos. Tzatziki was made from genuine Greek yoghurt, not from Finnish or German and therefore really enjoyable. 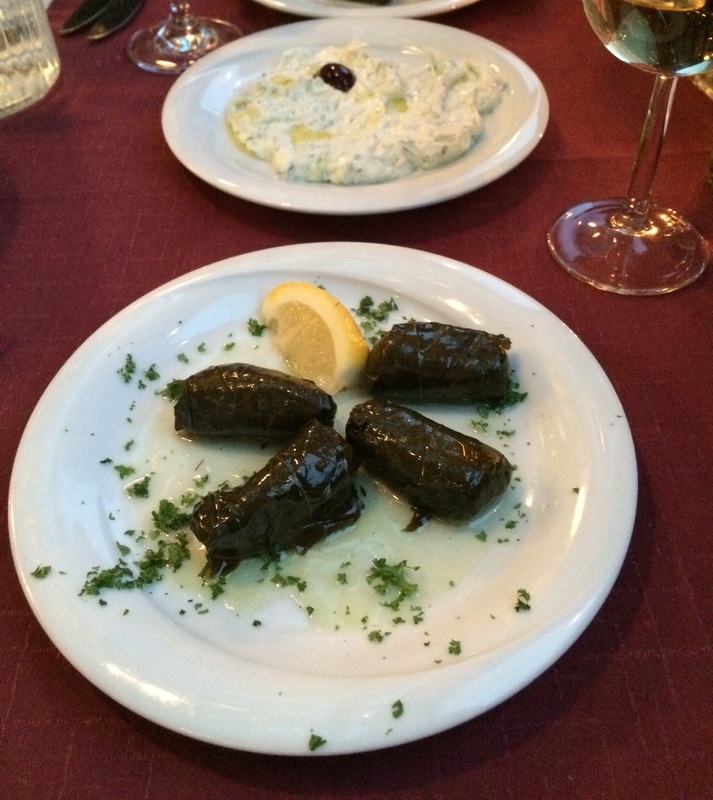 You can purchase similar dolmades from supermarkets in tins but so what, they were excellent. For main courses we had Grilled chicken breast and halloumi cheese salad and Seafood salad with prawns, octopus, tuna and artichokes. Chicken salad was excellent. Chicken itself was grilled as well as halloumi which makes the taste always better than fried or cooked. Seafood salad was slight dissappointment because there was only one artichoke (look the plural in the name) and somehow portion was a little bit wet. Maybe too much water from tuna fish can? For wine had glasses of Greek white and red wine. OK with food, but not so enjoyable without it. Minos is one of my favourite restaurants in Helsinki for meny reasons. 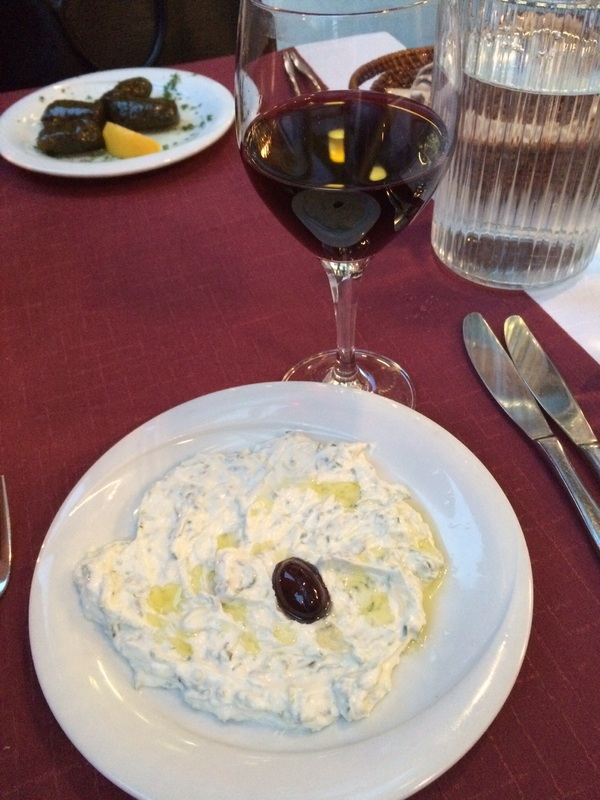 I like Greek food and Minos prepares it well. And dining at the terrace, either under glass roof our outside is always pleasure. Therefore overall grade is high. 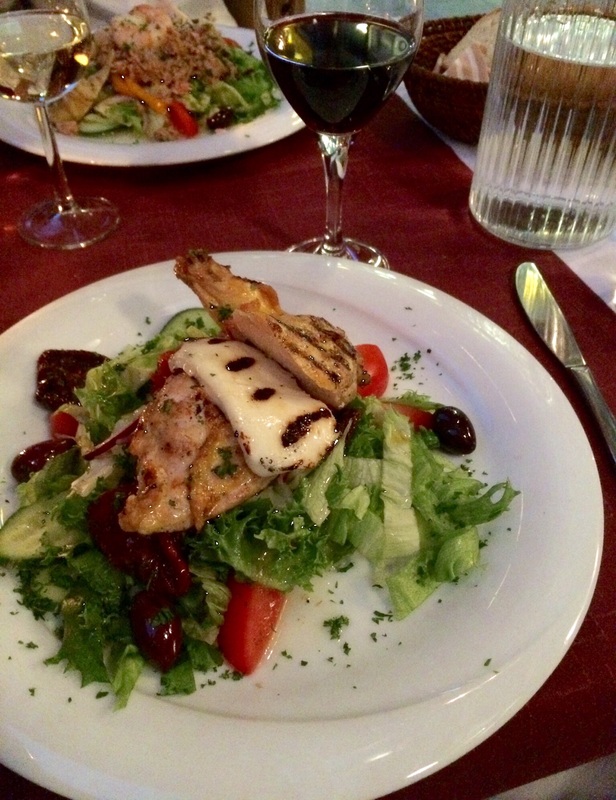 Another, a little bit more sophisticated Greek restaurant El Greco, is also worth to visit. Review can be found by using search. 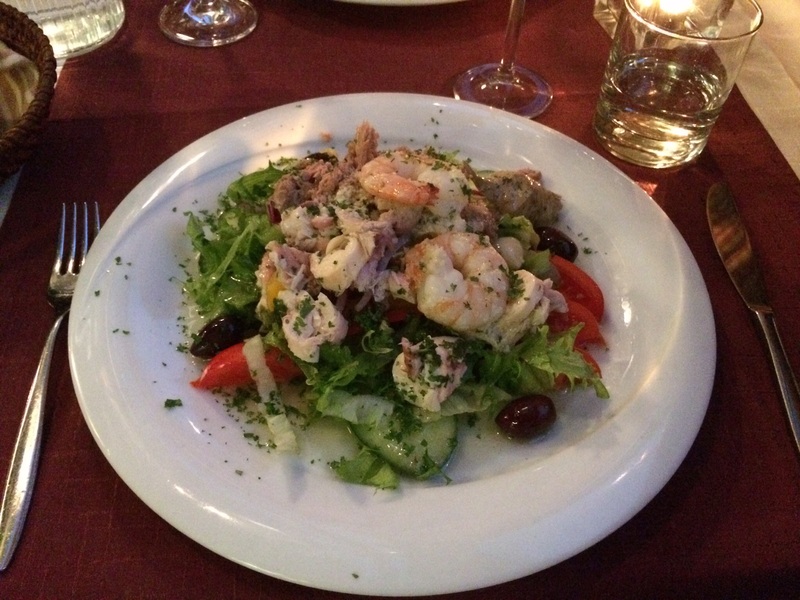 oh that salad of seafood looks amazing! Unfortunately it was not so great as it looks 😁 but eatable. Thanks for visiting post!